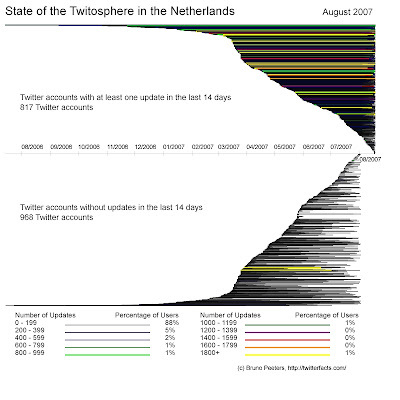 On April 22, 2007 I published the first state of the Twitosphere in the Netherlands. With this new state of the Twitosphere I want to give an idea how the Twitosphere in the Netherlands has evolved from then. Using the same approach as for the first state of the Twitosphere, I managed to find 2090 active Twitter accounts from the Netherlands. A Twitter account was considered to be held by someone from the Netherlands if the location explicitely refers to the Netherlands or if the Twitter user was located in the Netherlands according to one of the Twitter mapping mashups. The actual number of Twitter users in the Netherlands is probably higher as only 50% of the Twitter users specify their location in their profile (see this previous post). For a population of 16.57 million people (according to Wikipedia), the Netherlands has 2090 Twitter accounts, which means that there is a Twitter account for every 7,928 inhabitants. 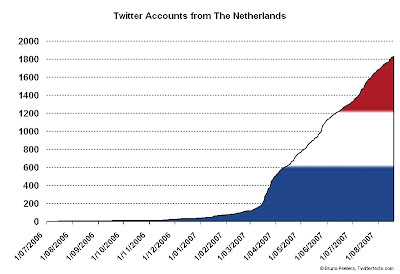 This graph below shows the history of the Twitter accounts in the Netherlands. The graph is based on the date of the first message posted on each of the public Twitter accounts. For private Twitter accounts (177) the date of the first message is not accessible. In addition to that, there are still 88 Twitter accounts without a single update, they are still waiting for the first message to be published. The growth of the number of Twitter accounts in the Netherlands accelerated from mid March 2007. This accelerated growth seems to continue until now. On an average day 8 new Twitter accounts are created by someone from the Netherlands. The graph below is generated only for the Twitter accounts where I could determine the date of the first message and the date of the last message, meaning that Twitter users without messages and private Twitter accounts were left out. The graph contains two parts. In the upper part, Twitter users who have published at one Twitter message in the last 14 days are plotted as a line, starting from the date of the first message to the date of the last message. The color of the line depends on the number of messages (also called updates) published. The lower part contains Twitters users without updates in the last 14 dates. These accounts can perhaps be considered as inactive accounts. The lines in the lower part of the graph are much shorter and show almost no colors. A while ago I published a blogpost describing 4 types of Twitter users : Lurkers, Bots, High Influentials and Twitter stars. On the graph below all 2090 Twitter users in the Netherlands are plotted according to their number of updates and the number of followers. There are currently no High Influential Twitter users (high number of followers but low number of updates). There are several Bots - Twitter accounts where the messages are automatically generated (low number of followers and very high number of updates). Luckily there are several Twitter Stars in the Netherlands, e.g. twitter.com/Dutchcowboy, twitter.com/erwblo, twitter.com/frankmeeuwsen, twitter.com/gervis, twitter.com/marketingfacts en twitter.com/tonie. To conclude this state of the Twitosphere, several top lists of Twitter accounts according to different criteria. Wat is nu het gemiddeld aantal Tweets per (actieve) Nederlandse Twitteraar? The total number of Twitter messages posted by those 2090 Twitter accounts is 357.173. This gives an average of 170 updates per account. There is however one very active account (http://twitter.com/ShopAHolic) with over 84.000 updates. If this account is not taken into account, the average is 130 messages per active Twitter account. The average does not reveal all information. 50% of the Dutch Twitter accounts have less then 12 updates. 5% of the Dutch Twitter acounts have more then 550 updates. Are there already more recent numbers available? 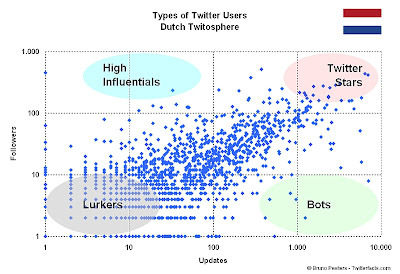 How many Dutch Twitter accounts are there in october 2008 for example? ik ben ook nieuwsgierig, dit zijn de meest recente stats die ik kan vinden. Maar ik zou graag willen weten of de trend in groei doorgezet is of niet. Beste Bruno, ik ben erg benieuwd naar de "Third state of the Dutch Twitosphere". Bovenstaande update is alweer van 1,5 jaar geleden. Bij voorbaat dank! Ik vermoed dat er ondertussen zo'n 10.000 Twitter users in Nederland kunnen gesitueerd worden op basis van hun profiel info. Ik probeer binnenkort nogmaals een update te publiceren. Het blijft nog steeds een beetje gissen naar het aantal Twitterrazzi. Als we alle meetingen moeten geloven ligt het werkelijk aantal ergens tussen de 8.000 en 11.000. Gevoelsmatig groeit Twitter nu harder en zien we meer en meer nieuwe accounts voorbij komen.